Digimon: System Restore: Data Squad Episode 06: The Ultimate Team No More? This whole thing almost went to hell over a fried egg. Marcus and Agumon team up at practically everybody's inconvenience, DATS legitimizes their partnership only because they can't deny the potential, and Marcus finally gets the stodgiest member of the team to acknowledge his worth. After all this, the partnership abruptly ends... because they get into an argument over food. You can tell this one's not going on any greatest episode lists. For a series that aims to skew a little older, it's surprising to see two consecutive episodes that are seeped in friendship lessons so sappy that even Twilight Sparkle would mock them. This sort of thing isn't unique to Data Squad, of course, but it's usually disguised a lot better. Friendship conflicts and resolutions are usually more nuanced than this, often with more interesting dilemmas and taking more than one episode to be resolved. I'll take Cody trying to figure out Angry TK any day over this mess. It's not that Marcus and Agumon have proven themselves to be rational or anything, but it's just so hard to believe that they'd really break the engagement off over dinner. 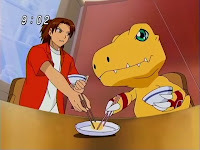 Marcus believes Agumon should defer to him and let the boss eat the last egg. Agumon thinks they should share the spoils as true partners. It's fun to have a Digimon that's headstrong enough to argue that he's as important to the team as the human. It's fun to have one openly complain that he doesn't get enough credit. It's hilarious that it's the one whose partner is actively fighting along and in a season where the human partner's DNA assists the evolution process. It's stupid that these two would just plain stop working together over this arguing. Consider the consequences for breaking up. Marcus is as good as fired from the Data Squad. Commander Sampson makes a big show of dramatizing this, but it's really common sense. Agumon's surely going back to the institute or wherever he escaped from in the first place, if not the Digital World in a very unpleasant form. Sampson could have just made that fact clear and expected the two to work it out on their own. Obviously he's a fan of that method, and here it would have actually been practical! One thing the episode offers is a chance at presenting workplace drama being treated like actual workplace drama. Nobody at DATS believes this is a long-term thing and try to talk some sense into both parties. Granted, only Yoshi bothers to talk to Marcus, unless you count Thomas's occasional snickering over the whole thing. Agumon's really the center of attention, despite locking himself in Marcus's digivice. Gaomon and Lalamon have what is basically a water cooler conversation with him, discussing how strictly they're expected to obey their partners (which, in Lalamon's case, should have happened out of Yoshi's earshot). It's the sort of informal chit-chat between Digimon that you have to believe happened all the time in season one but rarely got to see. The whole thing is resolved when Marcus is determined to take on a corrupted Garurumon (or just BlackGarurumon if you insist on accuracy over dub identifiers) and succeeds only in taking Gaogamon and Sunflowmon out of the equation before being overpowered. That's when he realizes that Agumon's ability to evolve is far more suitable for this sort of thing. Rather than sticking with his cheap proverbs, Homer takes the initiative of delivering Agumon to the battle, where reconciliation and victory are inevitable. There probably should be more of a mystery over who this Homer guy is and what connection he has to DATS, but by this point everybody probably just assumes he's Marcus's grandfather. The way Agumon addresses Marcus's mother might have far more significance in Japanese culture, but even dubbed it's jarring that he calls her Sarah and I don't blame Marcus for finding something wrong with that. Sarah is way too chipper hinting that someday Kristy will be happy that boys act the way they do. It definitely raises an eyebrow. While Gaomon is raising logistical arguments to coax Agumon out of his digivice, Miki and Megumi try luring him out with food. 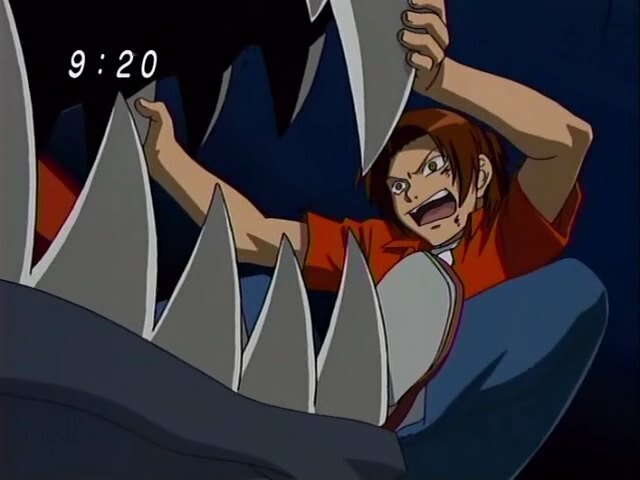 So much for DATS believing Digimon don't eat people food. 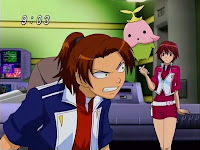 "So much for DATS believing Digimon don't eat people food."